Now, on to the last Montgomery-related giveaway for this particular Reading Challenge . . . Here's another set I picked up this past year . . . 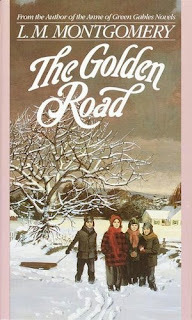 The Story Girl and its sequel, The Golden Road . These books are Don't Miss titles, especially if you are a fan of the Road to Avonlea television series. If you've watched the series on tv then you might run across a familiar episode or two in the reading. I hope you have (participated in) and enjoyed this Reading Challenge! I hope that if you haven't had a chance to read Montgomery, you'll give her a chance. Perhaps this contest will provide you with that opportunity. Happy Reading! Seriously, I would love to win these -- thanks for the offer! Your used books stores must be much better than mine!! I have managed to find one of LMM's books, but they must be snatched up pretty quick. I am seriously considering moving to your town! You, books, coffee shops and rain. Everything i love! Oh! I would love to win these! Pick me! :-) I need to read a LMM book(s) soon. Between my shelves and the libary I feel like I have so much to read right now. A good problem to have! I'm also joining a book club which should be interesting. What? Really!? Hmmm, good thing I was looking over your blog today. :-) Awesome!